A little more than two weeks ago, eve experienced its largest fight ever in B-R5RB. It was significant enough to significant coverage on most gaming sites, as well as some press from mainstream news outlets. Understandably, this has attracted a large influx of new players to EVE. This is apparent from reddit, where there are several posts per day from new players who feel lost and aren't sure what to do, are trying to find ways to make isk, or who lost a ship/did something stupid and are trying to learn from their mistakes. The influx of new players has not gone unnoticed by the Tuskers. Our home system of Hevrice is one of the closest low-sec systems to one of the Gallente starting systems. Under normal circumstances, it's not unusual for the occasional new player in a Venture or his first destroyer to wander into our system and promptly get destroyed. 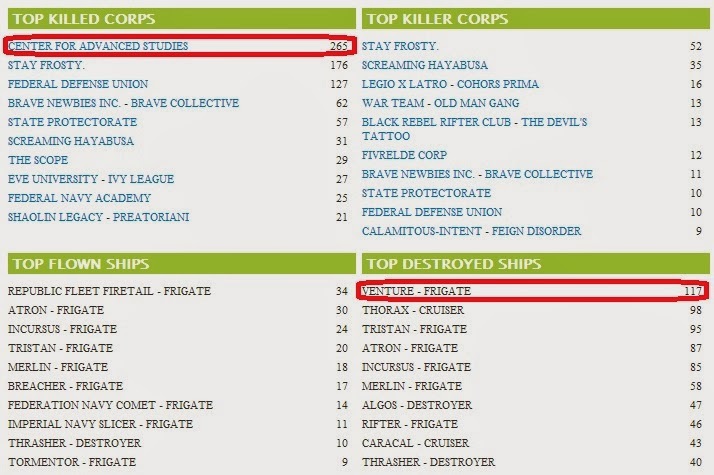 The past month has seen some changes: In the past month, Ventures are the #1 ship destroyed by the Tuskers, with the Center for Advanced Studies (an NPC starting corp) as the #1 victim. I destroyed a thorax who was at an asteroid belt earlier this week. He and a friend of his in a Tristan were both very new players. The Tristan pilot opened a convo with me afterwards, and we had an interesting discussion which brought me into the mindset of a new players. His first question to me was "What provoked the attack?". To someone who's been playing eve for more than a few weeks, this is obvious: I'm a pirate. My sec status is -10. If you're there, I'm going to attack you. I don't really care if you're in a Venture, a Thrasher, a Faction Battleship, or a blinged-out T3 cruiser; my primary purpose for playing the game is to get fights, cause explosions, and collect loot. Most other inhabitants of low-sec would do the same, after all if they weren't looking for fights, most them would just live in high-sec (or an empty area of null sec). To a new player though, this aspect of Eve is not so obvious. Virtually all PVP in other MMOs is either staged or voluntary for both parties. In the rare exceptions, such as Rogues who gank quest runners on PVP servers in WoW, there is no reward for the ganker, no real loss for the victim, and no depth to the gameplay mechanics that make it worth pursuing as a primary means of playing the game. We talked for several minutes, and I passed on whatever advice I could about how he could avoid losses in the future. I even passed on 15m isk so that he could replace the Thorax. Unfortunately, I'm pretty sure that he'll probably lose another ship pretty soon. I'm going to dedicate a couple posts to helping out new players, both in terms of survival outside of high-sec, and how to get started with making isk.